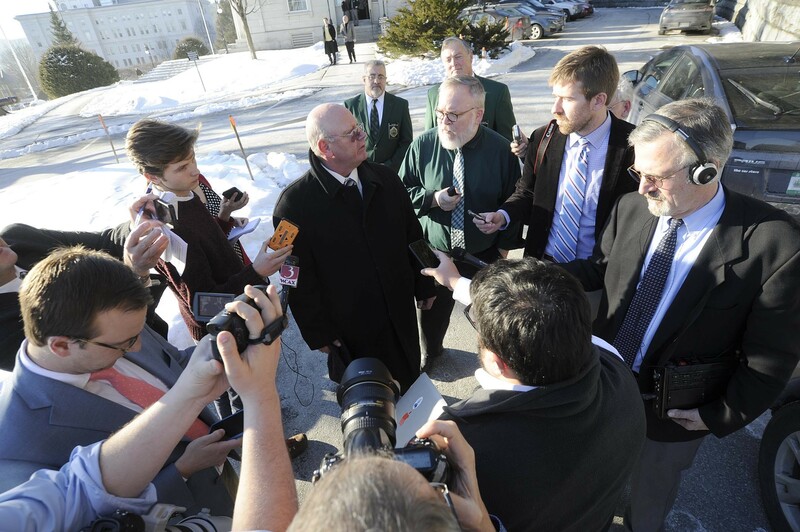 Then-senator Norm McAllister addresses reporters outside the Statehouse. Something big happened Friday — reporters met a deadline. More specifically, a coalition of Vermont journalists successfully got a media shield bill passed out of a Senate committee in time to make the legislature’s crossover deadline. The bill survived an onslaught of hypotheticals posed by lawmakers in the final hours before the deadline. Legislation had to be voted out of committee by the end of the week to make it to the other chamber this session — and therefore have a chance at making it into law. The task put reporters in an awkward position as they had to lobby legislators to pass a bill prompted, in part, by the fallout from a criminal sexual assault case involving former state senator Norm McAllister. Prosecutors in that case, which continues today, subpoenaed reporters from Seven Days and Vermont Public Radio who had interviewed McAllister. The situation drew attention to the lack of legal protection for journalists and their sources in Vermont, one of a handful of states that doesn’t have a shield law. The argument goes that whistleblowers and others need to know their identities will be protected in order to feel comfortable confiding in reporters. The bill offers different protections, depending on whether the reporter is speaking with a source confidentially or on the record. Sears, as it happens, was referring to something he himself had once said to Seven Days reporter Mark Davis during a 2014 interview. No one at the hearing Friday seemed to get it except for Davis, who watched the proceedings from the perimeter of the room. Later that afternoon, the Government Operations Committee passed the bill, which will now go before the entire Senate. After the hearing, Sen. Jeanette White (D-Windham), who chairs the Government Operations Committee and cosponsored the bill, had a suggestion for the reporters exiting the room: “Maybe you could do a story on how seriously we take this?” she said with a smile.